The three elites began to move towards the scene of the pair of men as she felt the hand of Hunter press against her shoulder yet again. He was certainly getting handsy. “What.” her voice came out eerily quiet making her wish she could just sink into the ground. Hunter tightened his hand in a calming attempt as stopping her from running. “This happens to be Roris Unilin’s apprentice.” the massive draglynn nodded to that though that did little to bring about a reprieve to her. “It would seem the young lass has proclaimed Copper’s life to belong to her. While I am not one to usually believe such folly, it would seem that going against her word is well… ill advised.” he gave a dramatic sigh, “Only due to the fact that she would be the one taking over Roris’s stake when he decides to throw in the towel, as it were. She has clearly stated if Copper’s life were to be harmed or even that of a prisoner in any way that… well… all works for the temple would cease. Now I know that it would be frowned upon by the Mother of Casbael herself if we didn’t at least comply to that.” He lifted a hand, “It is clearly stated in the laws of Casbael that the Guardians need to maintain a firm relationship with the craftsmen and or craftswomen of the lands; such as blacksmith’s, cook’s, maids, leather workers etcetera, etcetera.” she peered over her shoulder to him, what was he getting at. When did she say that? Was he actually helping or digging her grave faster? Rera blew out her lips, “And? How is this suppose to sway my mindset? Scarlet can blow it out her ear. I doubt it would look well for a woman to side against that of a temple.” Wyllow cringed under her sight. Who knew that Casbael had such workings inside of it. It was amazing to know that the mortal man had so much power over Casbael, at least the craftsmen did. Rera cursed mildly before she tossed back her head in a silent cry, her body shrinking contorting in terrible shapes until a erect woman of scales stood before them. Though she still was at least a good four heads taller than most of them. “Again that is part of the deal mistress… the sword must stay with-” she cut him off in a sharp hiss. Where was that grave? She was ready to jump in. Khondis stitched his eyebrows together at the banter between hunter and the Guardian Rera. 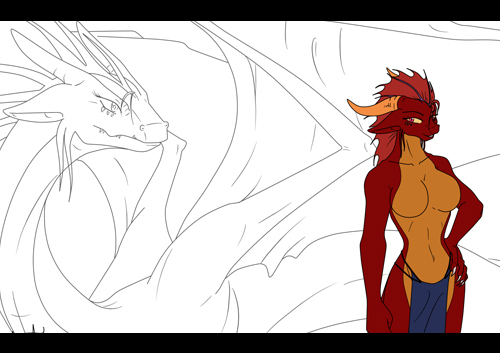 She was extremely large in her full form, as smooth red scales flicked in the sunlight. He bit his tongue as Hunter lied through his teeth. What was his angle? He really did find this all one big game, didn’t he? There were so many things swimming through his mind, but it took every fibre in his being not to torch what was just unfolding. He shared a glance with Wyllow momentarily as Rera stormed around angrily for a moment. “Apprehend the human, and let’s get out of here, the stench of blood is making me ill,” she grumpily flapped her massive wings, as she grew airborne the shrubbery whipped around as if there was a mini wind storm. “As you wish,” Hunter affirmed with a light shrug, fairly bemused by the whole lot. It was obvious he was immune to Rera’s grouchy nature, only proving his true worth in the temple would have to be that of an iron clad door. “You aren’t going to get away with this!” Rotend screamed “Who are the real thieves here? Murderers and thieves, Casbael is corrupt and will destroy the world!” Rotend almost roared with anger. Hunter only laughed, his laugh even made Khondis angry and wanted to slap him. “We have a pretty good run going, I don’t think thousands upon thousands of people would vow their allegiance to us if that was the case, it’s a shame that you feel that way though, it may be part of the reason why you are in the predicament you are.” Hunter placed his hands in his coat pockets. “Don’t under estimate me ecchial…” Rotend grunted under his breath as the Elites escorted him back to the caravan. Still, what could possibly be the reason behind Hunters lie, and what could Rera possibly do to him, now that Wyllow was essentially his body guard, in the proverbial sense. He felt himself snorting at the idea of Wyllow physically defending him, he looked over at his shoulder at her, holding back his chuckle. “This jerk actually lied for us, you might have to bake him a cake or bread or something…” He raised an eyebrow, “That or ask him,” he looked back at Hunter “ARE YOU TRYING TO GET US KILLLED?” Khondis snapped, speaking directly at Hunter. Seeing the strong brown haired Ecchial tossing his attention momentarily back to her, Wyllow gave a sharp snort through her nose at the man and his snap towards Hunter. While she didn’t even dare to pretend to comprehend what Hunter’s angle was by forcing her and Khondis together –anymore and she was almost afraid that someone was going to glue them together. “Oh…” she skewed her mouth, “Suppose…. But why bind him to me!” she blurted out in a whiny teenager protest before she slapped her hands to her mouth. Khondis rolled his eyes. All this banter was driving him up the wall, and he felt his skin crawl at the idea of having to be a goody, goody to anyone of the Casbael order just because he felt the necessity to save them. “So you may have saved our asses, what could you possibly get out of all that? You went on about the relations, and Rera may have bought it for now, but unless Roris somehow magically appears at the temple, she ain’t gonna buy it for long. She can easily send one of her all mighty Elites down and question the old man.” Khondis scoffed at Hunter. He just shrugged as he looked back at Khondis. “Ah, she could in fact have a messenger sent. But I’ve already covered that. Now that the human that was after you has been apprehended one of the three Elites should already be on their way back to the town to bring Roris immediately. Before Rera even knows what’s going on, he’ll be in the Temple quarters granting you permission to travel together. He owed me a favour anyways.” Hunter smirked almost devilishly. “And I admit, I do have an angle.” He brought up an index finger to Khondis and Wyllow. Khondis stopped walking and crossed his arms. “Oh here we go,” He grunted. “You expect me to believe that,” Khondis glanced over at Wyllow while raising his eyebrow. “The Temple was given a very large request for supplies from Roris right before we left, you were both already in Caravan as he gave it to me. There are some rather unusual… components requested on it. Do you care to fill me in, Wyllow?” Hunter raised an eyebrow in question. Having the entire conversation shifting over to Roris, she could easily say how uncomfortable she was feeling. Everything was up and above her head and yet Hunter was playing a game that was so closely knit that she was wondering if it was even possible for them to move without him already having it plotted out. Having Roris brought to the temple was startling as she hadn’t even seen that Hunter had made arrangements for one of the elites to go and retrieve him. Hunter was smooth and slooth in it all. She had shrugged to Khondis in an adamant confusion when he glance to her with a single eyebrow raised. She was literally the little pawn on the chess board being shuffled around in a frantic banter with no control of herself. Tapered ears lifted with her name being called forth as it took a mere moment for her to process what the employed Casbael ecchial was asking. Dropping a hand to fiddle nervously with the loose key around her neck, Wyllow absently pursed her lips together in a sad attempt to assort her thoughts. She knew what he was talking about, but giving an actual detail to the requirements Roris had requested was something else entirely. Just because she was his [i]apprentice[/i] didn’t mean he filled her in completely with all his requests. All she did was look over them, use them as he told her and finished the work. Hunter knitted his brow clearly unsure what he should believe. Though she was trying to lie through her teeth about it all. She knew the schematic was for an evolving weapon but it honestly was not her place to even say. She was only the apprentice and Roris was the master. If he wanted to tell Casbael then it was his job; not hers. But then again she shouldn’t have to lie about it either. It was a fine line and she wasn’t sure where she crossed it. She wrinkled her nose and tightened her hands to her sides feeling about as good as a worn out heel in some beggar’s shoe. Bile soured her mouth with her words while it was plainly obvious that Hunter didn’t really buy what she stated. But if he was going to drop it for the time being, then she was certainly not going to push it. “How much further is it too the temple Lord Hunter?” she didn’t like the way the silence was suddenly creeping up on her skin. Tucking some of the straw blond hair behind an ear, she rubbed her lips absently together while she cantered her body back and forth in a steady rock of hips and bust to keep a stern move with Hunter’s own movements. While she was belittling herself for her own folly actions of lying, she couldn’t help but have the mind’s eye wandering back and forth over the strange occurrence of the sudden kindness of Khondis earlier and the gravitating pull that Tondris seemed to have on all sorts of people. Though if she had to pin point the anomalous of either current thought, the idea that Khondis had willingly admitted he may need her help was the one that pried at her more so. She just… just couldn’t even begin to understand the man, nor would she honestly want too. Everyone had their own proverbial Pandora’s box, but with how Khondis acted so aggressive and boorish to everything… that was a box far better left alone.